I've been a bit behind on the mineral eyeshadow business - I can't really give a good enough reason as to why but I really handnt experimented too much with them. That all changed about a month or so ago when I was on ELF's website and they were having a 50% off mineral makeup sale. 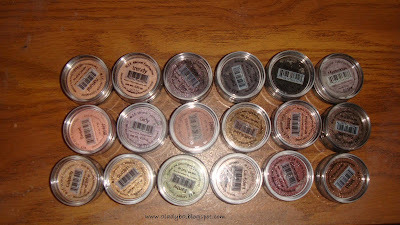 I remember seeing one of Lolliipop26's videos where she mentioned buying all of the mineral shadows - and that is exactly what I did folks. I have to first state that their shipping is still horrible - I ordered something online a few days after placing this order- and recieved a few days before my ELF order came in. That is really annoying - BUT the eye shadows are absolutely lovely !! My Thoughts: I haven't been able to play with all of the eyeshadows (no surprise there) but I really like Natural and Royal. The neutral and shimmery purple go so well together. Overall the quality is really nice and very very fine - so even a novice can work with them without too much effort. The downfall - of course is the packaging. It's really hard to work with sifters - you get a lot of product and it's always a hassle. But for the price and the color payoff - I think these are amazing.